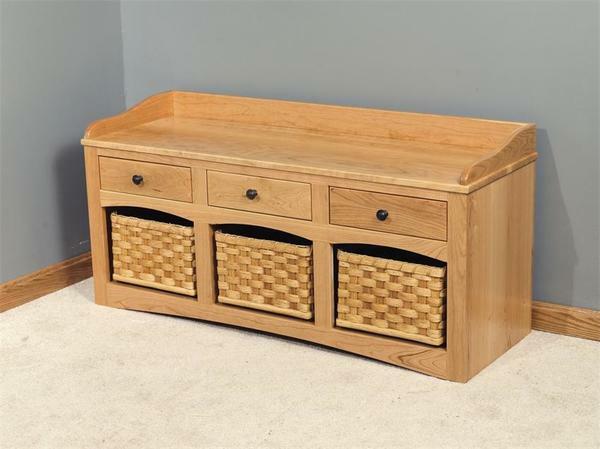 The Amish Storage Bench with Baskets and Drawers offers delightful storage wherever you need it. In the foyer, the kids room, the mudroom or a bedroom this gorgeous solid wood storage will draw users to it. Lovely bench seat makes changing shoes comfortable for all. Three drawers and three baskets open easily to store items neatly. In addition to the style, gorgeous wood and added storage comes the knowledge that this bench will last for always. Amish made furniture is top quality in function, style and durability. Thanks for shopping today at DutchCrafters.